How did Louis Pasteur’s theory of fermentation differ from the accepted concept of fermentation? French chemist and microbiologist Louis Pasteur (1822–1895)—one of the founders of medical microbiology—proposed that fermentation is a process carried out by what he referred to as “living ferments.” Other renowned chemists of the time believed that fermentation was a purely chemical process in which microorganisms were a by-product, not the cause. 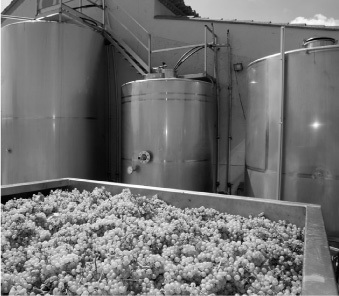 Grapes sit in a bin awaiting processing in fermentation vats, where yeast will digest them and turn sugars into alcohol and carbon dioxide.